Bishop Ward fund to receive $400,000 gift – Welcome to Wyandotte Daily! 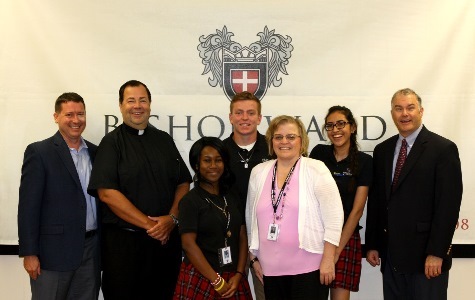 The Loretto Foundation has pledged a $400,000 gift to support the Bishop Ward Student Scholarship Fund. On a recent visit to the school, Lamar Hunt Jr. and James Arkell had the opportunity to meet with students and see their investment in both “education and values” first-hand. Loretto Foundation, LLC was founded by Lamar Hunt Jr. and is dedicated to helping build stronger families by encouraging spiritual growth. The name Loretto comes from the Sisters of Loretto and their abundant prayers for help. “I am honored to have the support of the Loretto Foundation and I am thankful to have the patronage of these two men of faith, Lamar Hunt, Jr. and James Arkell. Their commitment to Catholic education in the urban core is a sign of their passion for Christ especially in HIs call to help those who are materially poor. This gift makes it possible for many deserving students to have the opportunity to succeed in achieving their dreams,” said Bishop Ward President, Father Thomas Schrader. Hundreds of young people at Bishop Ward have already benefited from the past generosity of Hunt and his family. Thanks to Loretto Foundation, many more students will continue to benefit from a Catholic education in the urban core. Joshua Sukraw is the marketing and social media manager at Bishop Ward.